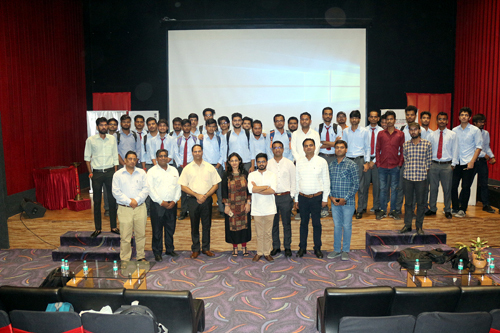 On 27 August 2018, a session on “VIBRANT GUJARAT STARTUP AND TECHNOLOGY SUMMIT -2018” was organized by the Department of Electronics and Communication Engineering. At first the Dr. Stayendra Sharma, HOD, ECE welcomed the guests and motivated the students regarding the entrepreneurship by saying a quote “Don’t be a job seeker, be job creator”. Then the mic was handed over to Dr. B. R. Mishra, HOD, ME. He shared the opportunities and challenges of entrepreneurship. He explained the opportunities by takin the example of Walt Disney and challenges with the help of a survey done by times of INDIA. Then the guests of session were invited to start their session. At first Mr. Swaroop Pnadya, Associate startup support, Center for innovation incubation, IIMA, gave the introduction about the SUMMIT and he also gave some famous examples of entrepreneurship like UBER, OLA, Make MY TRIP etc. He explained about the whole process to participate in SUMMIT with new innovative ideas. Then Ms. Kahani Seth, Vice President, ECO system, NXG ventures, started her session by introducing and discussing the grand challenges which are coming in this new era. She also shared the issues coming in startups by showing a movie on technology 2018. Whole session was very informative and interactive. 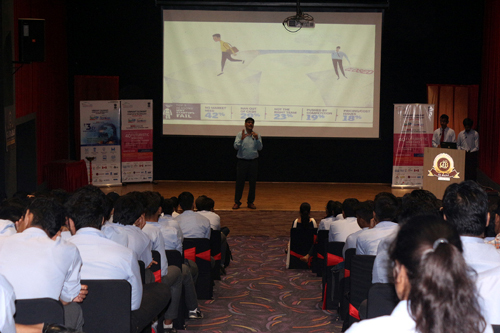 This session was attended by approximately 150 students of different departments.